Thirsty Pilgrim: Tobacco Companies Need Not Fear the Next Generation of Young Belgians. Tobacco Companies Need Not Fear the Next Generation of Young Belgians. Been running ragged all over town this snapping photos, breaking my own personal records for time logged on trams and buses. And lots and lots of walking. Lots. It's been fun but tiring, so it was a much-needed few beers enjoyed with Adeptus of the Bitten Bullet last night. I'd just been waxing poetic about the De Dolle Cosmos Porter from the Zythos fest, wondering if the beer would ever be widely available, when we wandered into the Delirium Taphouse and found the blessed thing on tap. Surprises rarely get more pleasant. Its intensity and complexity were nearly enough to make us forget the smoking, singing hordes of drunken Belgian teenagers. Belgium, by the way, is one of the West's last great bastions of public smoking. It's still cool here. 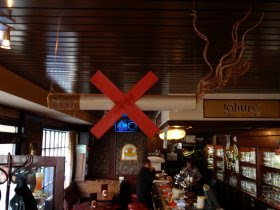 No-smoking stickers in the dining areas of cafés and brasseries are more amusing than anything else. One pub here took it up a notch with some arts and crafts hanging from the ceiling. You would think people would get the hint. Or at least the joke. It's a nice little place too, with a solid beer list in a part of town with few of them. I'm not ready to tell you where it is yet, but if anyone knows I'll be really impressed. I quite enjoyed the busy feel of Delirium, despite the three or four rounds of happy birthday that were sung.